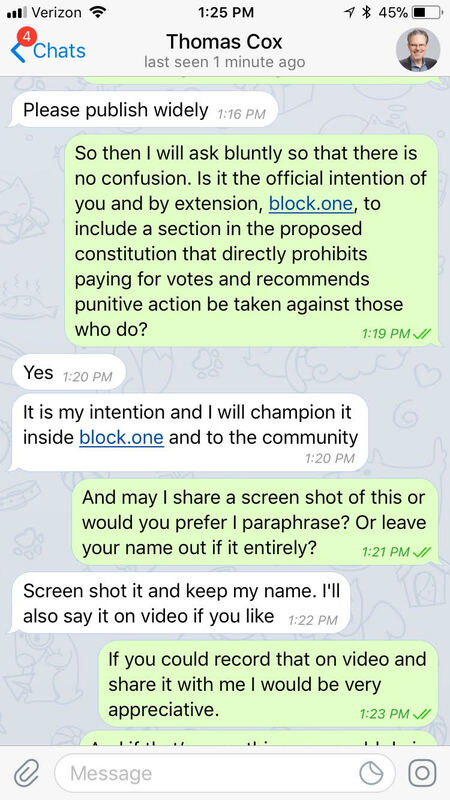 Thomas Cox of Block.One Confirms Vote-Buying Will Be Against EOS.IO Proposed Constitution. There has been much debate of late in the EOS community across the globe regarding vote-buying/voter kickbacks. This debate is healthy as we embark on this journey into the uncharted waters. EOS New York has made our position known to the community that we do not support vote-buying or kickbacks in any form in our previous two posts: here and here. Thomas Cox of Block.One has confirmed to EOS New York directly that voter kickbacks would be strictly prohibited by the proposed constitution and would be met with penalties. The constitution(s) being written is a proposal, it must be ratified by the community. The penalties which Thomas mentioned are still being thought through, are not yet final, and also must be ratified. Many Block Producer candidates have already announced their intention to distribute voter kickbacks or dividends: EOS Union, EOS Mao Lao, and more. We hope they see Thomas’ comments and join us in the global debate. What do you think? Let us know on twitter, join the telegram channels, or leave your comment below. Additional Note: We have since retracted our request for a video from Thomas so please do not expect one unless Thomas chooses to record one of his own volition. Totally in agreement. Absolutely no kickbacks. Hello, good publication, keep it up, we follow each other? Great information. I agree that this is the best way to move forward for EOS. Thanks for the update! EOS is really really decentralize in digital coins. It's going to be a very hard one to police too of course. I mean how would anyone know that a holiday to the bahamas was paid for by a BP in return for votes? Obviously I hope the constitution will include a way to prevent this but when money is at stake bad actors can be very creative and you can bet that their creativity is going full twirtle on work arounds for this at the moment. While this is a good move by @eosnewyork and adding these clauses in constitution makes sense that point at large this had to be accounted in someway at the code level of EOS itself. We have already seen what whale-cirlce-jerking can do to a community in Steem blockchain. I hope EOS will have better measures against a similar let down in EOS. It is still all premature and hence I am open to waiting for a couple of months to see what actually transpires. It will be good if Steem and EOS can learn from each other's experiences. Please note that we are not involved at this point in time with the authoring of the draft constitution. But we are firm believers that vote-buying is an economically damaging tactic. The constitution is code. It is a ricardian contract that places its hash on every transaction broadcast to the network. No transaction can be broadcast without the hash of the current constitution. There is no way to enforce this on the code, right? BP will have to pay user anyway for renting their EOS it will be hard to differentiate. It is important to discuss how we can increase participation by token holders to strengthen governance. Ricardian contract -> hash included in every transaction. Arbitration is the only way to enforce, not through code. Not sure what you're referring to with "pay user anyway for renting their EOS". Can you elaborate? If Kickbacks or Dividends are promised, then the highest paying Block Producer will obtain most votes. It may turn into a Zero-Sum game if kick-backs are promised ...... and this may work against the interests of the EOS blockchain to develop speed and reliability.